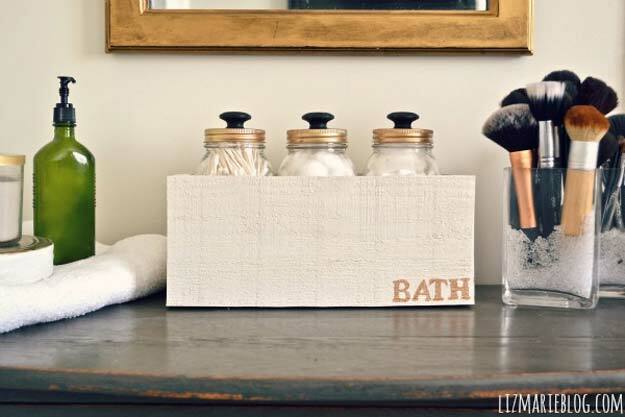 Need some cool DIY ideas for your bathroom? 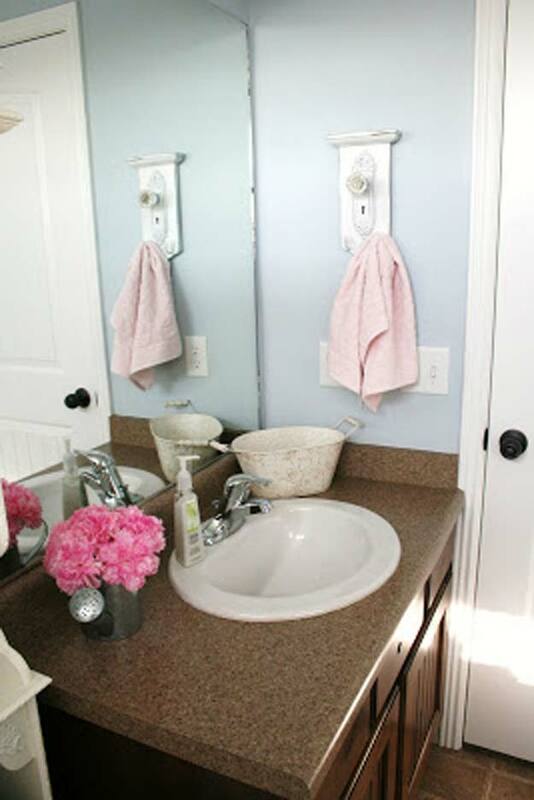 Are you jaded of your bathroom being dull and mundane and lifeless and stale? 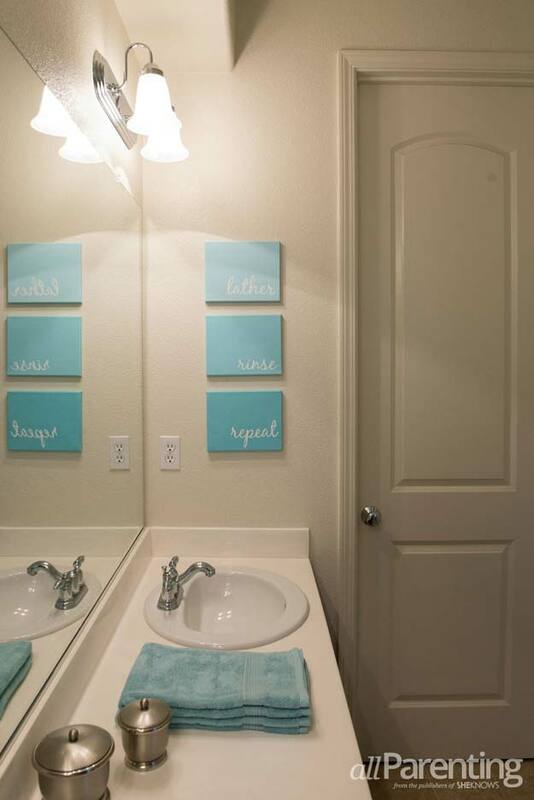 Have you always wished for a bathroom that’s so beautiful it will always give you a lighter mood when you go in? Oh yeah, I bet you do. But if you are thinking that only Moms and Dads can fiddle with your home to make it look splendid, nah.. I hate to break it up to you but you are wrong. So. 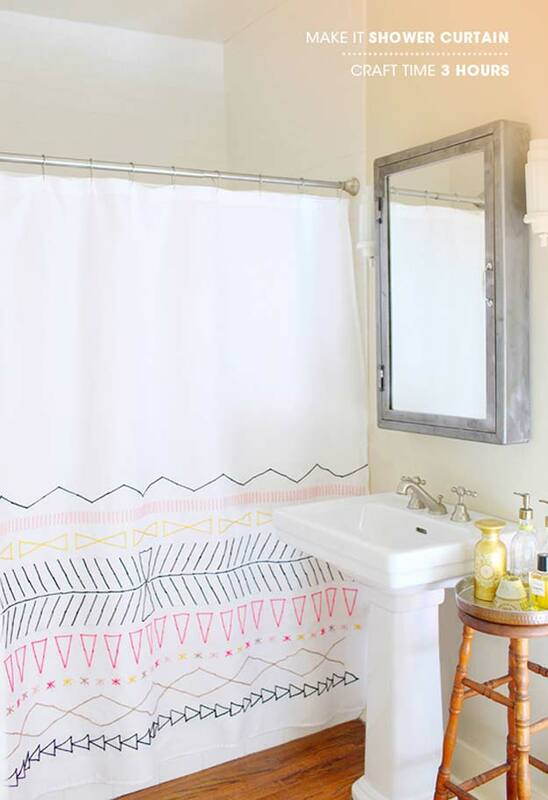 What can you do to your bathroom that will definitely put a fun vibe, lively spirit, merry character to it? There are a actually A LOT. And they are not expensive nor complicated for a teenager to do! 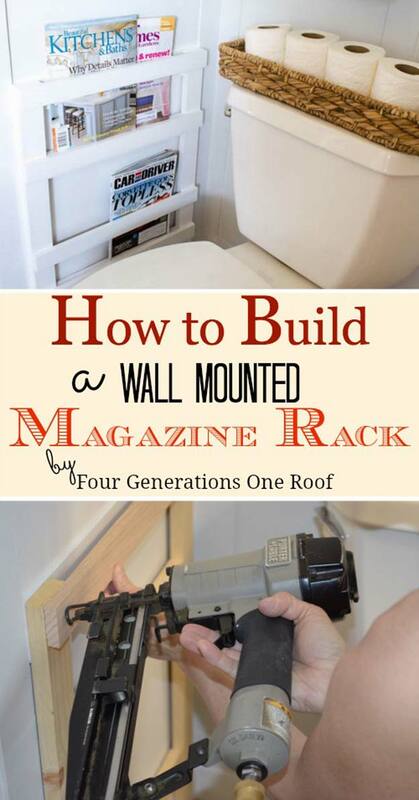 We have gathered 36 projects that can help you achieve the bathroom you have long wanted. 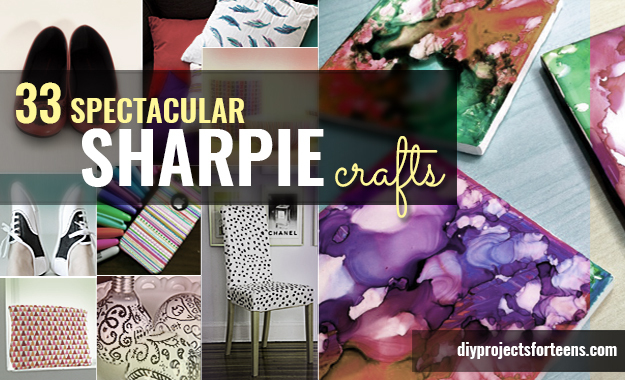 Get ready to do a total makeover to your organizers, shower curtains, towel racks, shelves, bath rugs to wall art projects! You don’t have to stack and pile all that bottles in a corner. 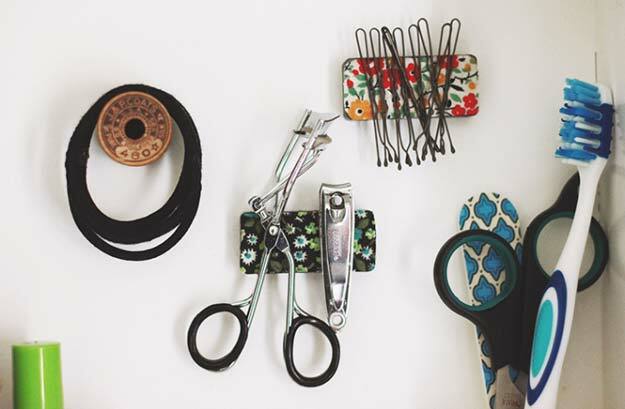 You can make this rotating organizer instead and start organizing! 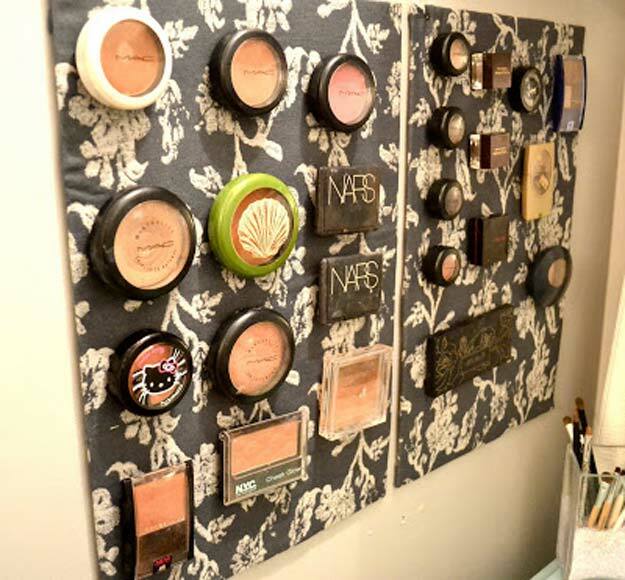 Let us put a twist to that mainstream make-up organizers we have all seen. 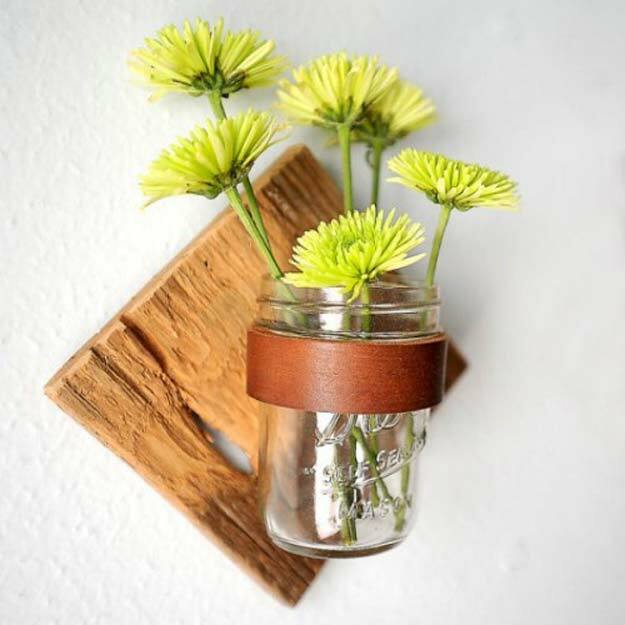 Get rid of those tissue boxes and grab some mason jars! 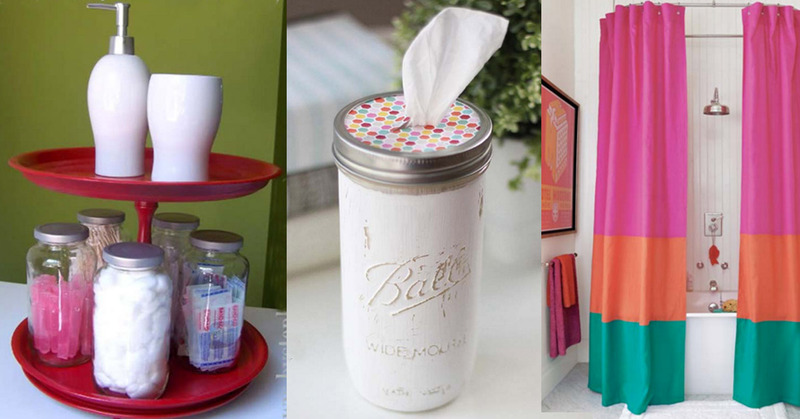 Let’s DIY some mason jar tissue holder! 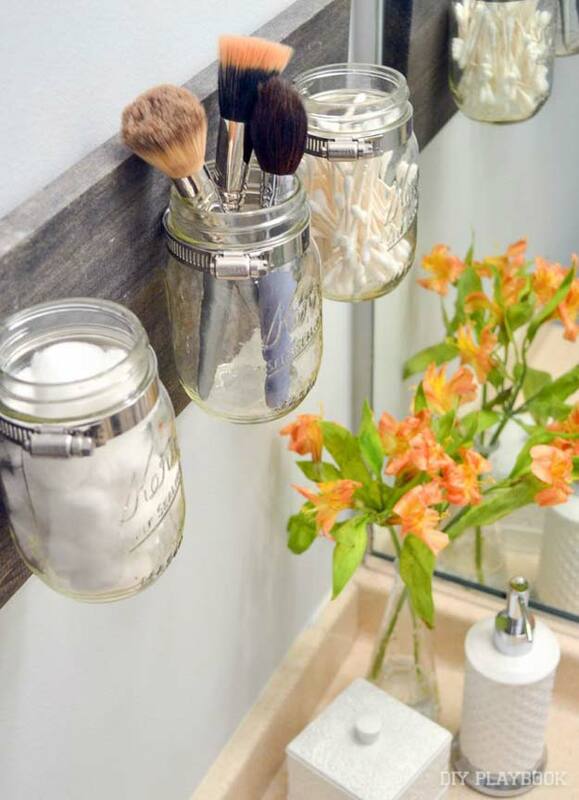 Make-up brushes, cottons and cotton buds are some of the things these mason jar can help you organize with. Have you a beautiful cloth you do not have a purpose for? Grab it and start beautifying that medicine kit! 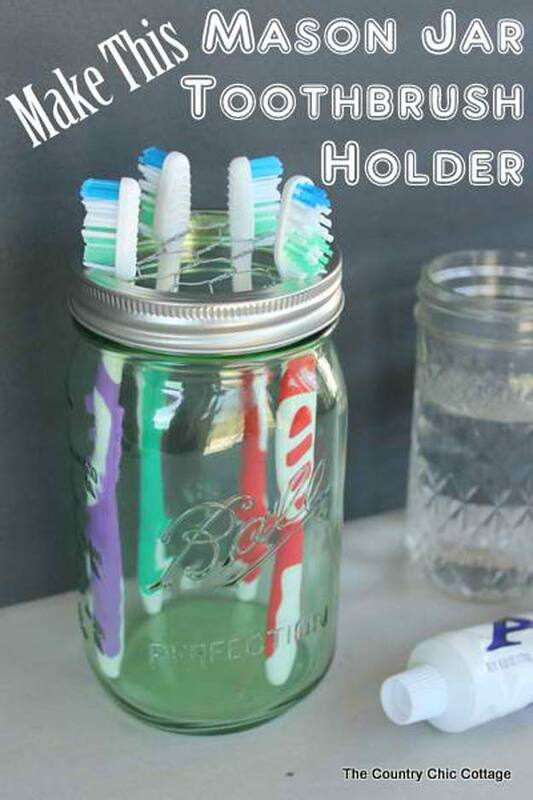 What a clean, neat and tidy way to store your toothbrushes! 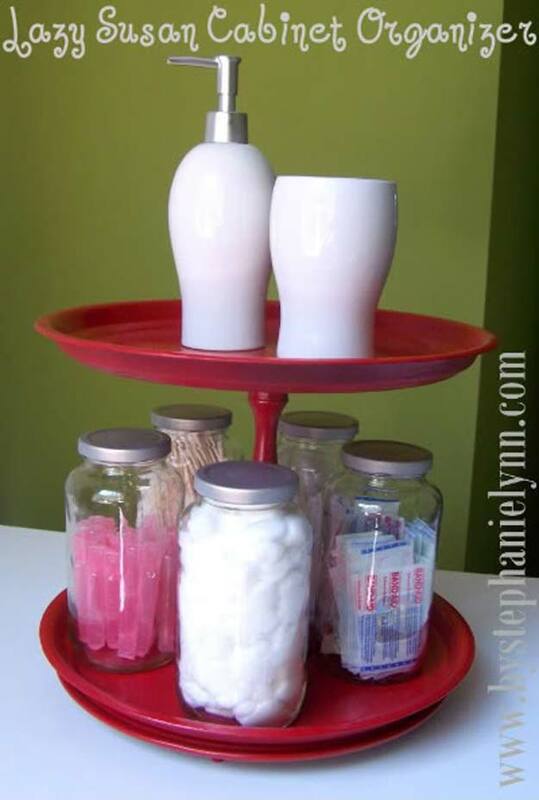 This mason jar organizer idea is so handy dandy you’d easily fall in love. I think we’d all agree that this one here is more than pretty! 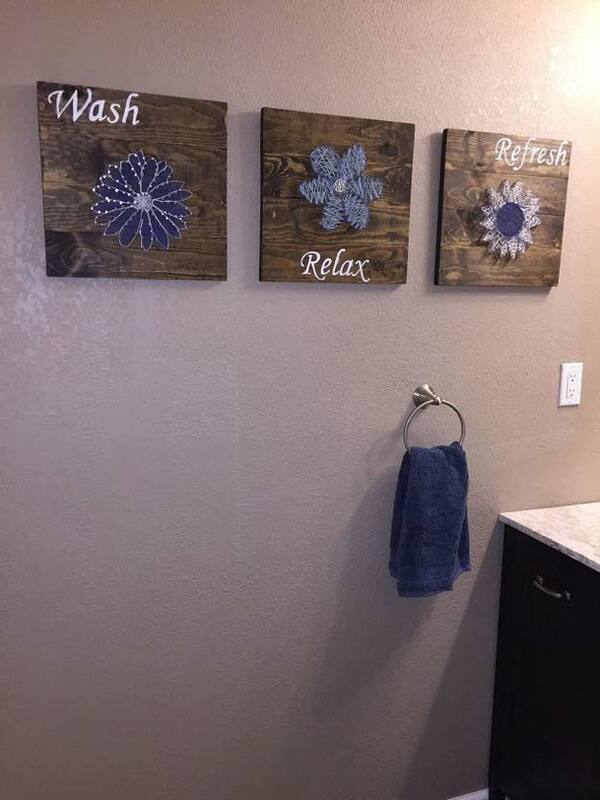 And if you are a girl, then you need to have this in your bathroom! Hands up to you who’d prefer to read a magazine while doing your uhh.. you know.. — than facing your phones! Add some breezy vibe to your room with this beach-inspired wall art. 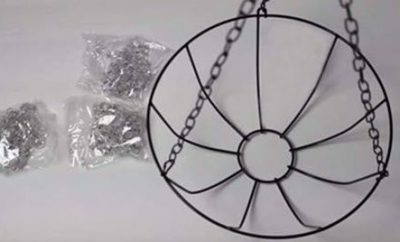 Not in for mason jar organizers? No problem! 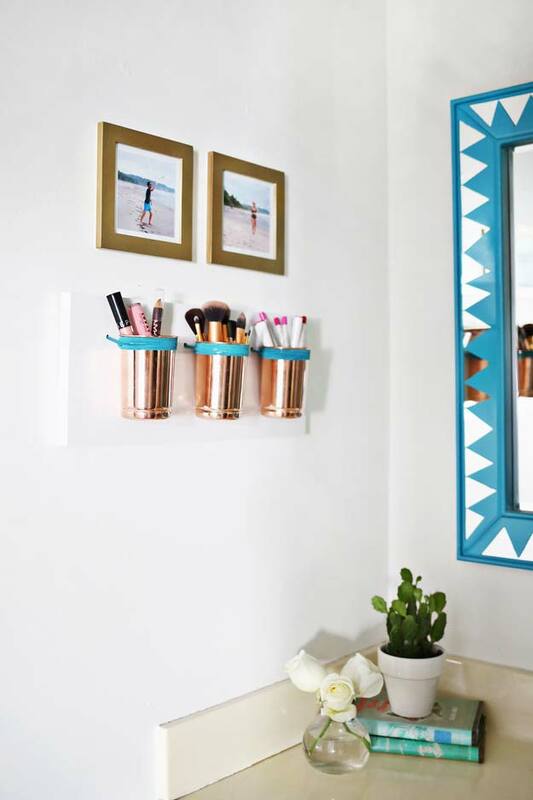 We give you this leather copper cup organizers! 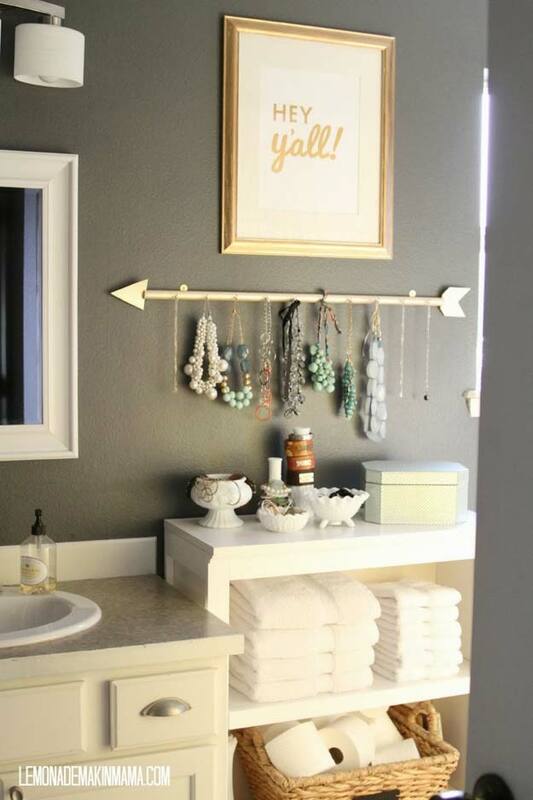 Okay, so you love to add a touch of earthly colors to your bathroom theme. How about some rustic mason jar scone? Dang!!! 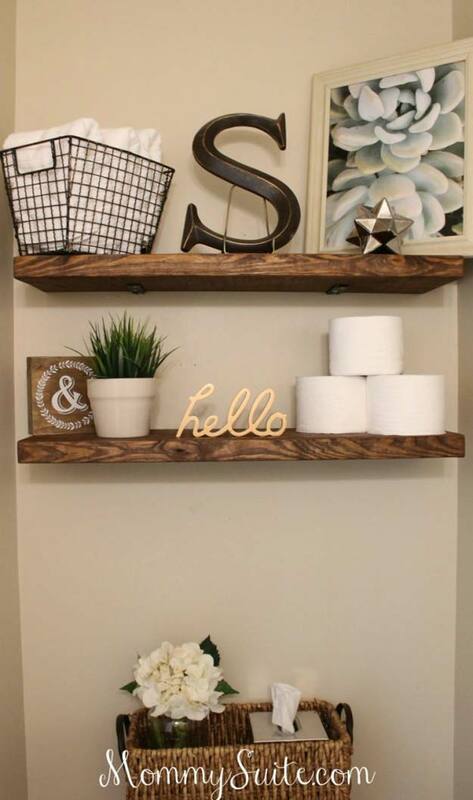 We all love this jewelry holder idea! 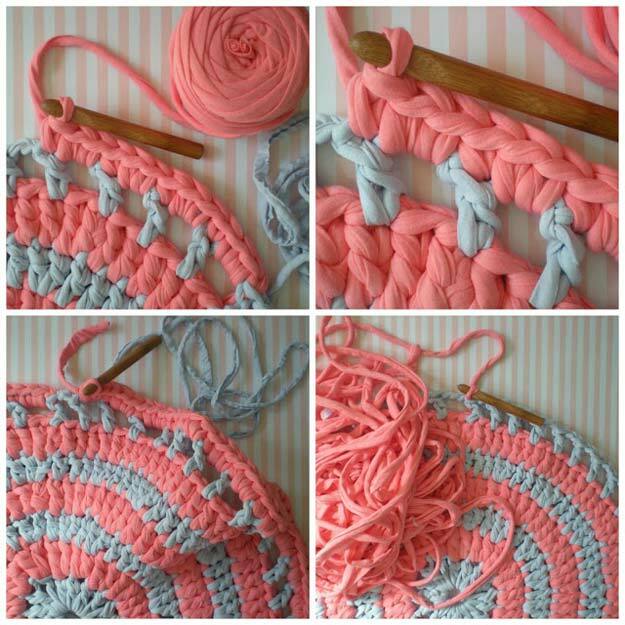 Put a twist to that towel hanger! Who said you have to be conventional? Uh-uh. 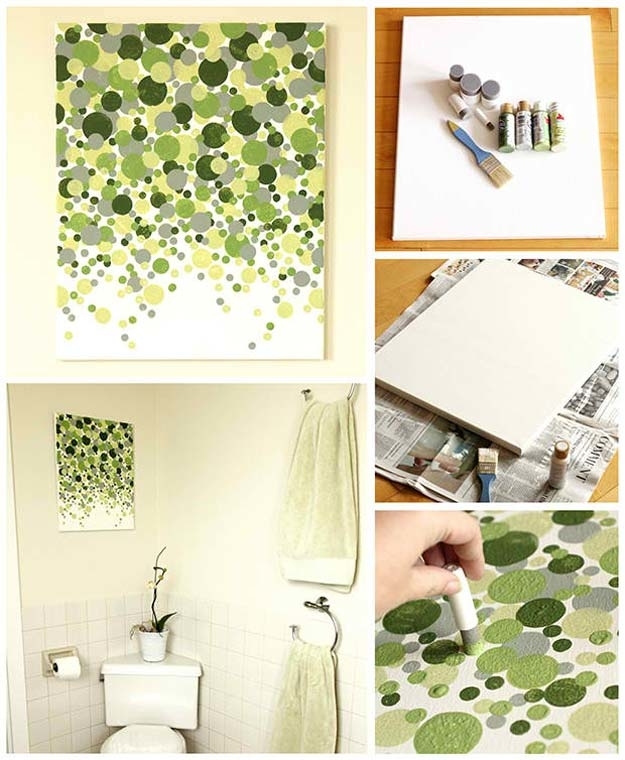 This green polka dot wall art will surely give you that fresh, invigorating morning feeling! 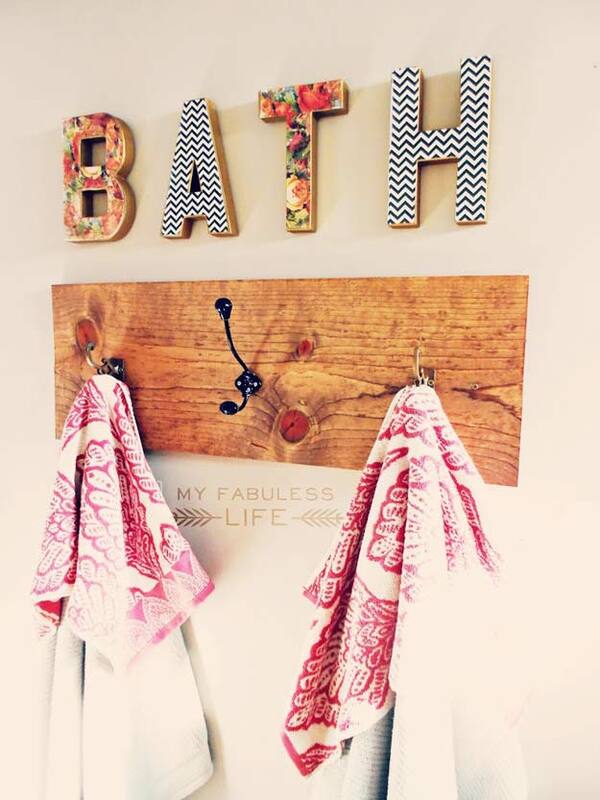 Now this is one kind of a towel hanger you’ll adore! 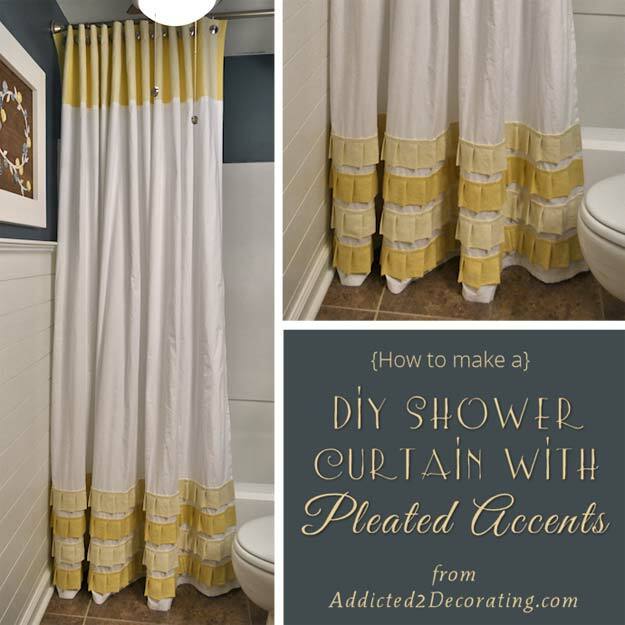 If you want some puffly ruffly curtains to your bathroom, follow thi tutorial along! Kids love whales. But so does everybody and I bet you too! 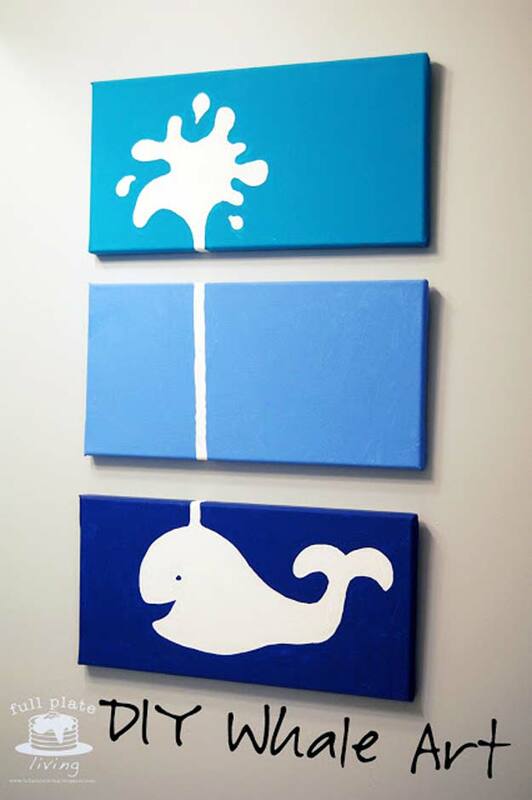 This whale wall art is a cute addition to your bathroom wall! Can’t really find shower curtains that fits your aesthetics? 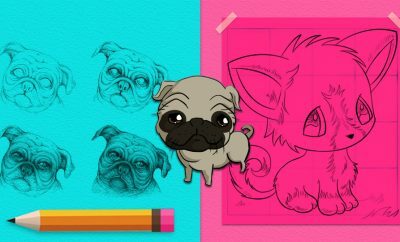 Make your own with your very own choice of colors! 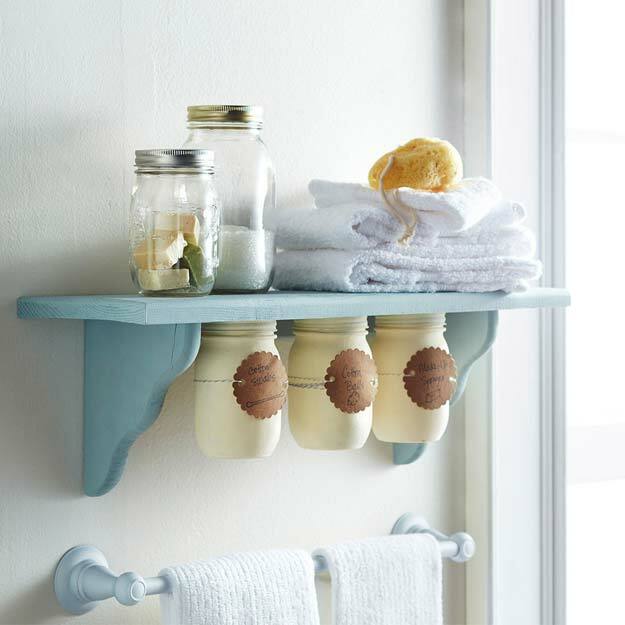 If you run out of space, this undershelf mason jar organizer is the perfect solution. 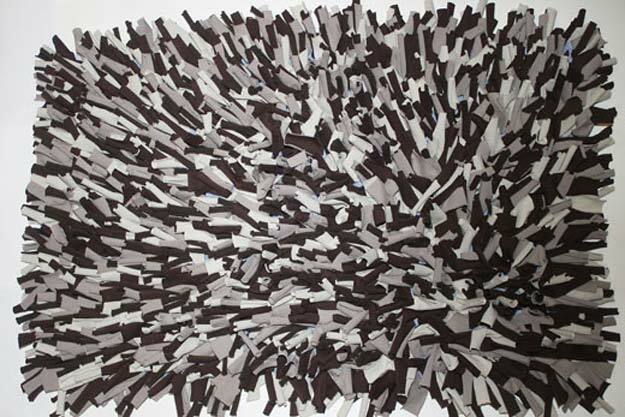 We’d all agree that a comfy, puffy rug feels like heaven after a good bath. 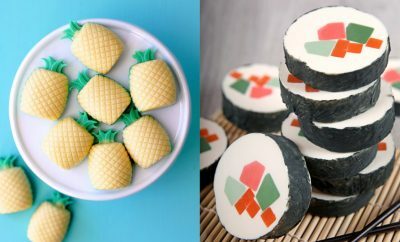 Now you can make your own through this tutorial. 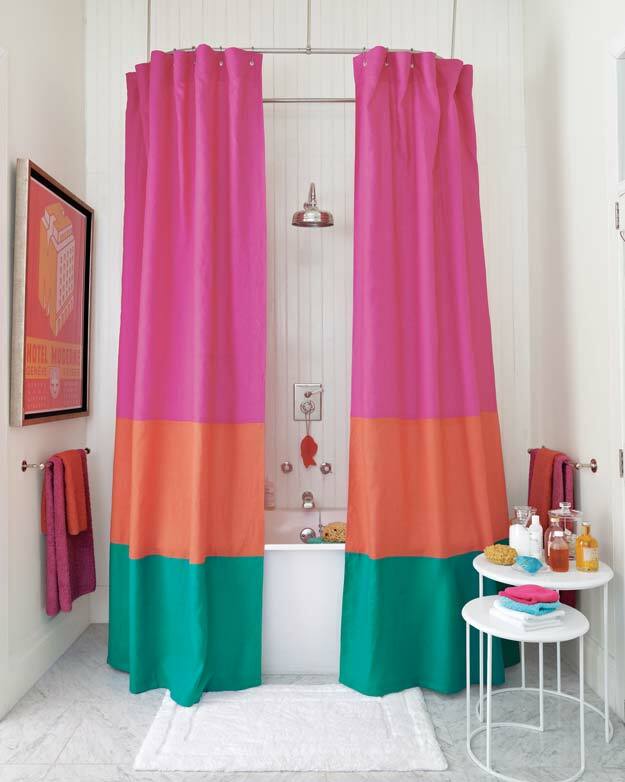 You’ll surely love a colorful shower curtain that will brighten up your day. 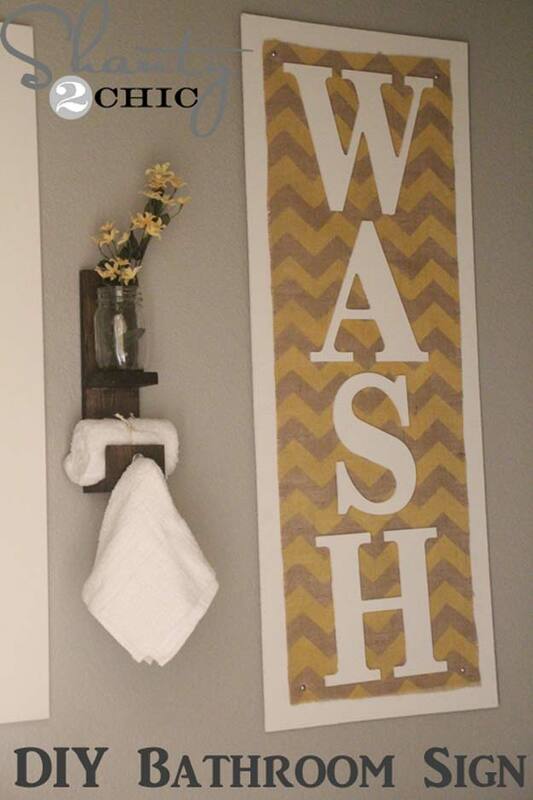 If you love chevron, we give you this easy, cheap bathroom sign! 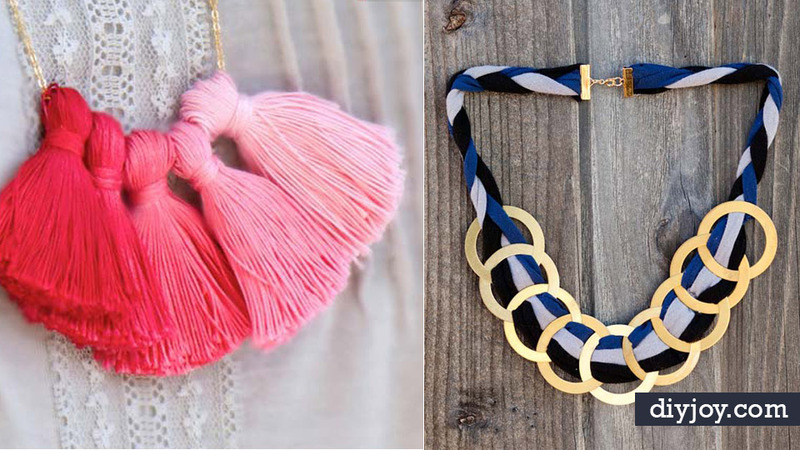 Do you love ruffles? Oh we do because ruffles rock! 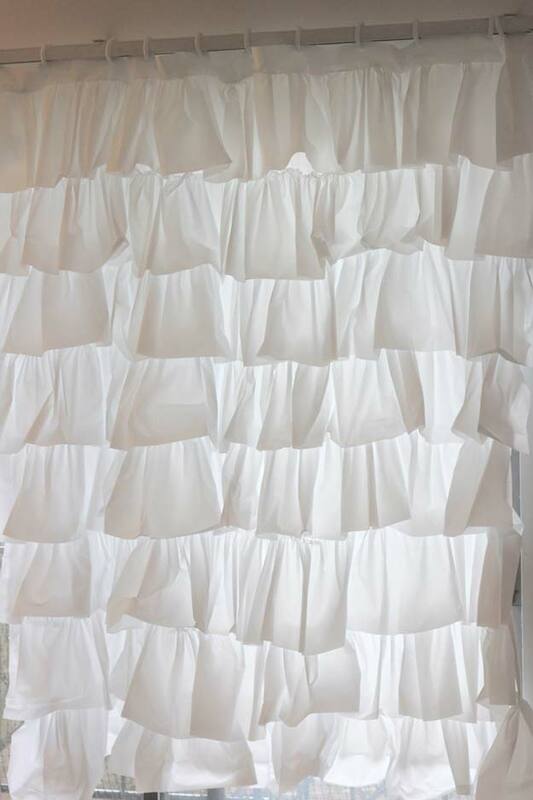 Learn how you can do your very own ruffled shower curtain here. Brighten up your day and have that loving vibe with this easy to pull-off canvas wall art! 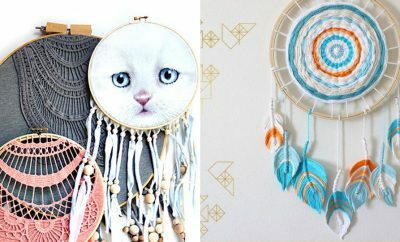 Do you love to sew? Perfect! 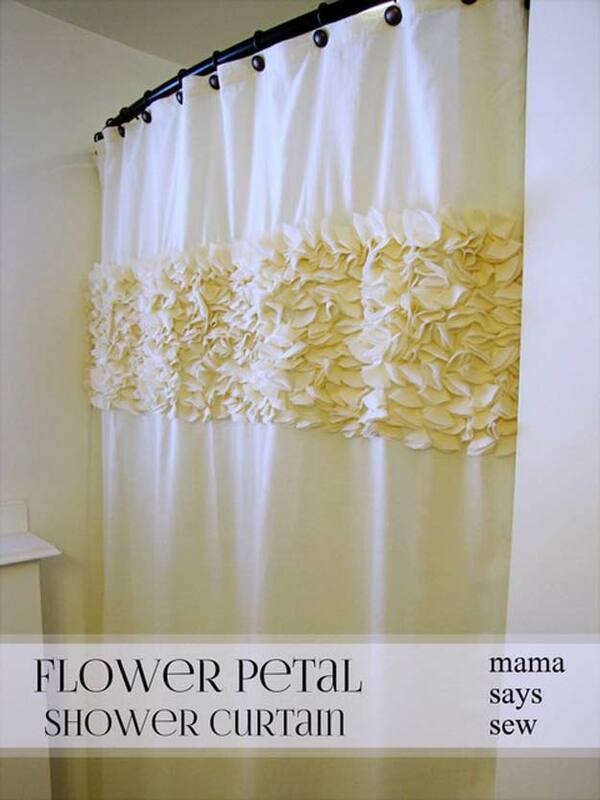 We’ve got this flower petal shower curtain to keep you busy with! Have you got a lot of tees you don’t use anymore? 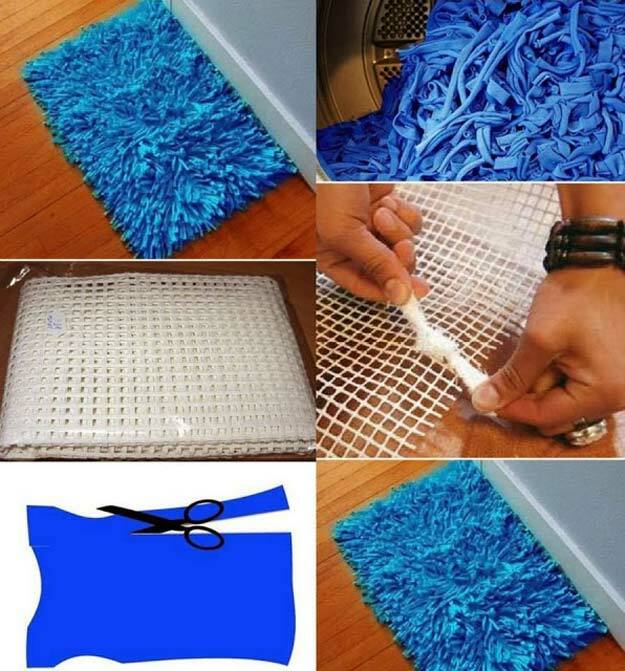 Make good use of them with this crochet rug! This lavender-inspired wall art will help you relax a lot from any negative vibes you got from the outside world. 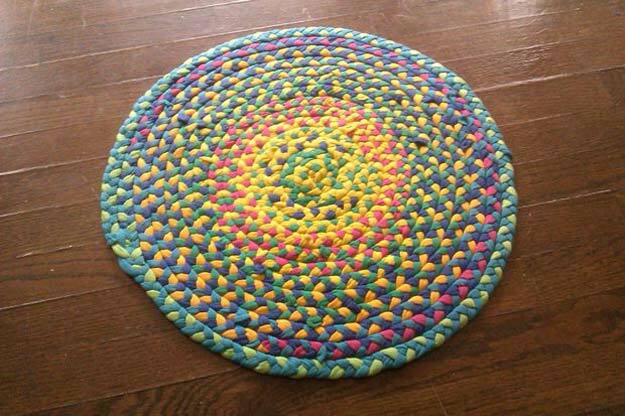 This multi-colored braided rug will make you feel at home! 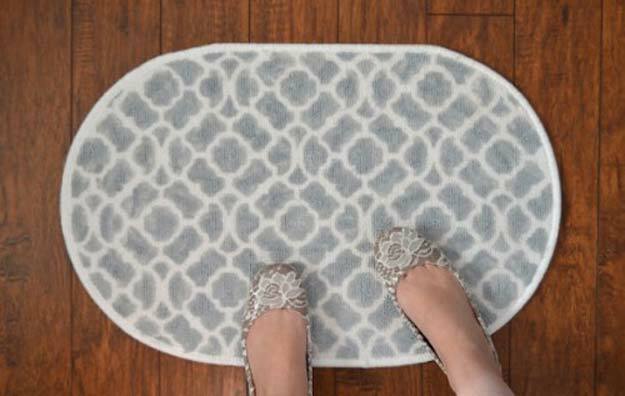 Want to be original and make your own patterned rug? This one’s for you! 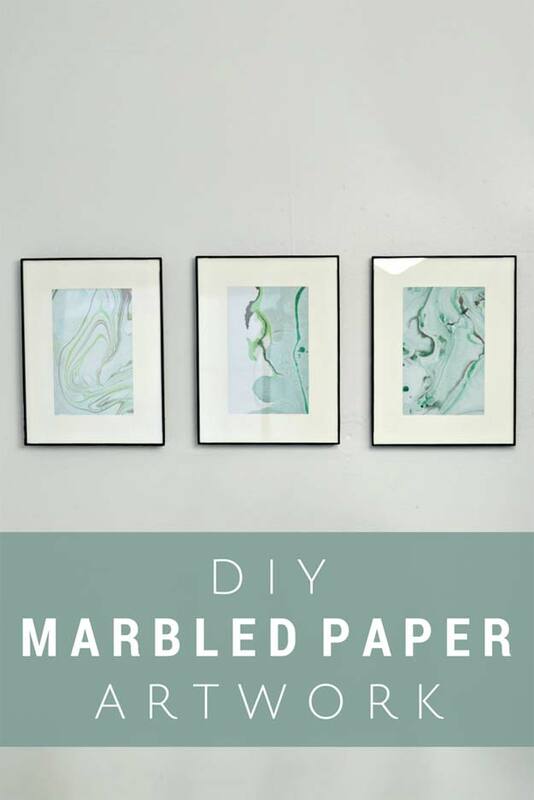 A cheap, easy homemade art wall that will up that boring wall is something you just might need. 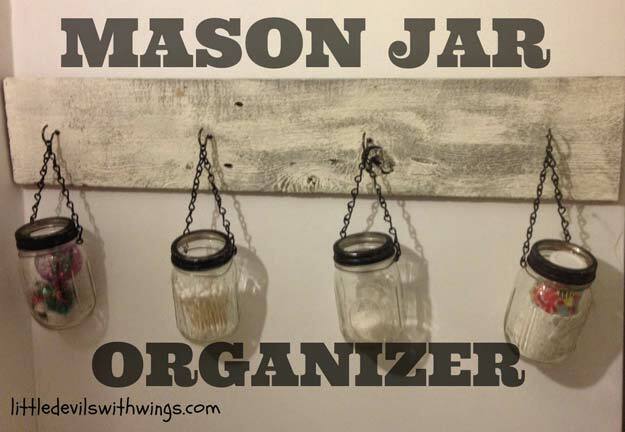 Let’s do chain-hanging-mason-jars to organize your stuff. They are pretty cool and badass too! 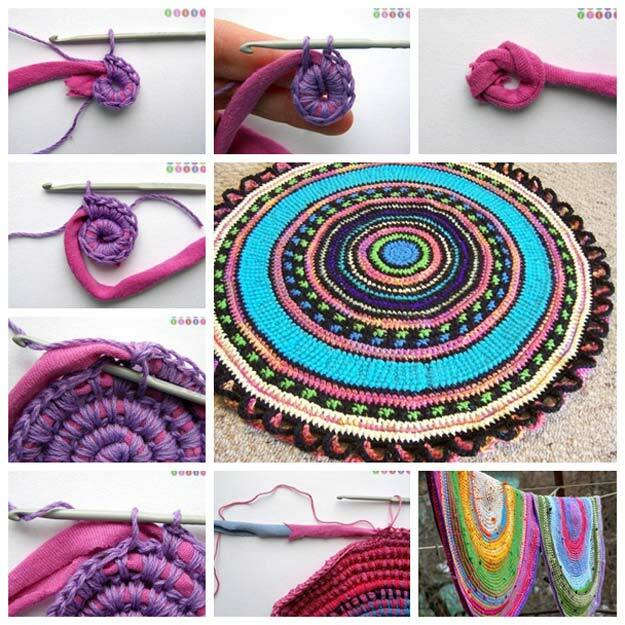 Now you want to go crocheting a huge mat? 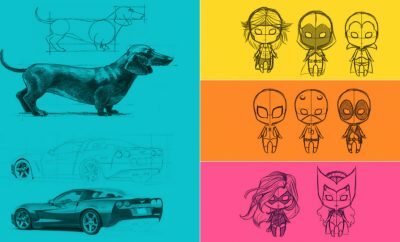 Here is a step-by-step tutorial you’ll 100% enjoy and love!